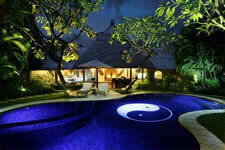 The Villas Hotel lies in the heart of Seminyak on Bali's southwestern shore. Located on Kunti road 1 kilometer from Bali's world famous sunset beaches. Only 30 minutes drive from Denpasar's Ngurah Rai International Airport, Seminyak has become an up market residential area with a variety of quality entertainment, shopping and fine restaurants. The Seminyak area is quieter than the main tourist area of Kuta and has a relaxed mood and laid back atmosphere created by a blend of Balinese and Western style and culture. The Villas Hotel design and service concept is unique. A clear separation from traditional boutique hotel's, emphasizing total privacy and full service. Found throughout each Villa are selective original oil paintings, statues, ironworks, woodcarvings, stone works and much more. All Villas include fully fitted kitchens as well as separate dining and lounge areas. All bedrooms are air-conditioned and have in-room safety box, satellite television system and an en-suite bathroom. The Villas Hotel services allow our guests to set the level of service they desire. Our Staff are prepared to cook for our guests, drivers are on standby to offer our guests complimentary drop off's within our local area.Guests may also be completely independent and have total privacy yet still enjoy regular hotel housekeeping services. Included in the hotel's services are restaurant delivery services and grocery shopping service. The Villas Hotel offers seven single bedroom Villas, each with it’s own individual design. All Villas are fully appointed including stereo system with CD and Audiocassette, dining area, lounge area and a fully fitted kitchen to compliment the space for personalized service and convenience. Private entrances to the Villas open onto colourful lush gardens. The gardens designed in keeping with the style and feeling of Bali’s tropical flora surround your own private pool. The air-conditioned bedroom provides comfort and luxury with a stylish décor. The Villas Hotel bedrooms include in-room safety box, international direct dial telephone, satellite television and en-suite bathroom. Hotel offers fourteen fully self contained three bedroom Villas. Each uniquely designed with spacious living areas providing style and comfort. All are fully appointed including stereo system with compact disk and audiocassette , dining area, lounge area and a fully fitted kitchen to compliment the space for personalized service and convenience. Private entrances to each Villa opens onto lush landscaped lawns and colourful gardens that surround your own large swimming pool and lounge chairs, thus reacting an environment of comfort and relaxation in a secure , private and completely discrete setting . The bedrooms provide exceptional luxury and comfort with stylish discreet décor. The Villas Hotel bedrooms include in-room safety box, International direct telephone, satellite television and en-suite bathroom. The Villas hotel is committed to efficient and discrete Services for our Guests. We endeavor to meet any demand our Guest require.